Today we entered the next step of parenting. The step that will contribute to flabby biceps, we transitioned to a toddler bed. No more lifting a 30 pound toddler in and out of cribs. No more cribs. For 4 years and 4 months our house has been home to a piece of furniture that defined where we were in our “family” life. But I really liked it because I could be okay with my decision that we weren’t having anymore babies since we still have baby things. 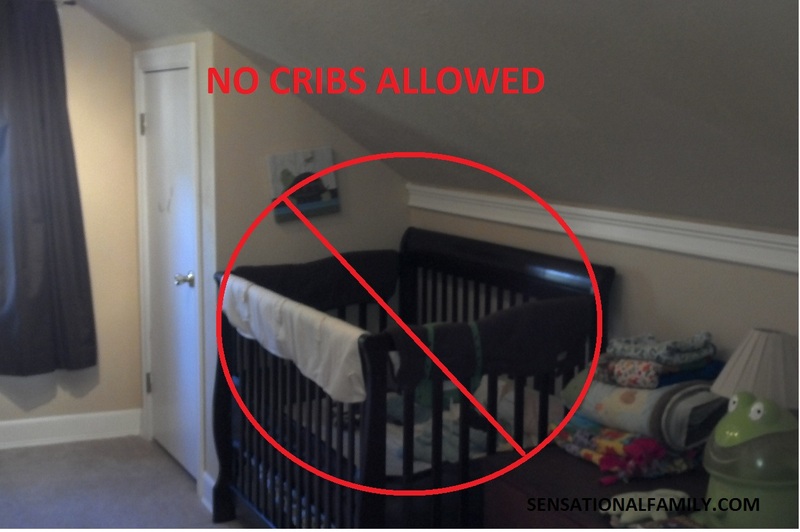 Now without a crib I have to accept that we are moving on with our lives. We are moving out of bottles and bumbos and into a world that has preschool and napless afternoons. Don’t get me wrong, I look forward to this stage but it’s the same insanity that makes me cry when getting rid of their baby clothes that makes me nostalgic for the times they were babies. I don’t even know why, they cried and vomited and were awake all the time. Why would anyone be sad about saying good bye to that??? I couldn’t tell you, but I am. The only thing getting me through this tough time is the happiness in my Wild Card’s face. He thinks his new bed is the best thing ever. And technically it’s his crib, just missing a side (kids are so gullible). Tonight he cried “get out” as he was put in his bed and Stampy said “you can get out” but he never did. It was almost like he was so accustomed to protesting that he just had to do it. So there it is, both of my children are sleeping in their beds. Not cribs, but beds and I’m going to have a little wine to help me get over myself and into my bed tonight and not snuggle in and cling to my baby.